The increasing demand for bone graft material in revision arthroplasty and tumour reconstruction requires a thorough understanding of the natural history and biology of autografts and processed allografts. A number of reports in the literature indicate that bone grafts may have a failure rate approaching 25% (Mankin et al. 1987). The failure is a result of inadequate revascularisation and mineralisation of the bone graft. Immunological rejection of bone allografts still remains an important consideration in the failure of these grafts. 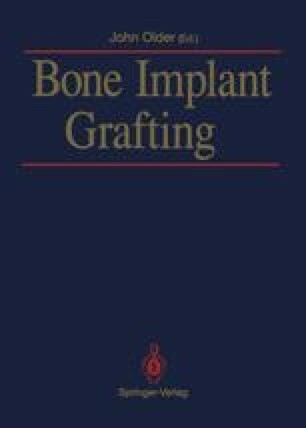 The natural history of bone grafts has been defined from extensive laboratory studies and clinical experience (Goldberg and Stevenson 1987). This chapter will review the present knowledge in this field.